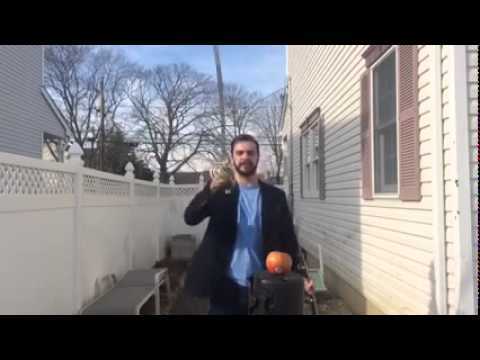 Please Note : All testing videos have made by experts. Don't try to do this. All of our items comes Unsharpened, and they are for collectible purpose. 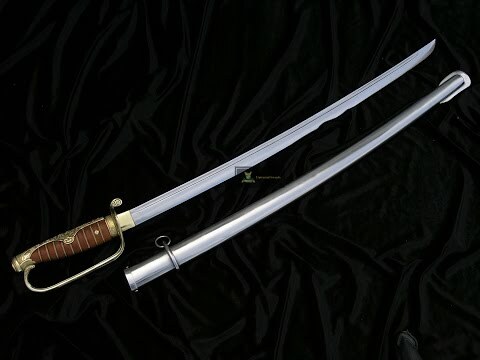 Russo-Japanese Kyu Gunto Army Sword is called Kyu gunto or ‘’Russo-Japanese’’ swords, these katana and western saber hybrid swords were used by Japanese Army and Naval officers in WWII, the earlier Russo-Japanese war and Imperial Japan’s colonial conflicts. 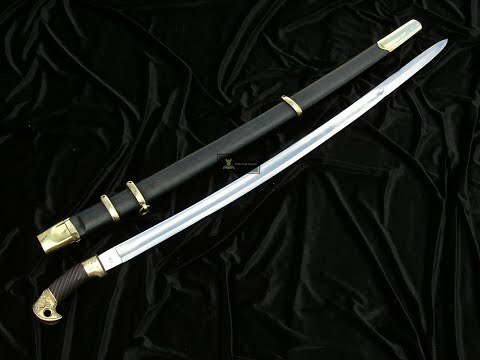 They were produced from 1875 until 1934 and existed alongside the more traditional looking Shin-Gunto swords. All officers in the military were required to wear a sword as a badge of rank. 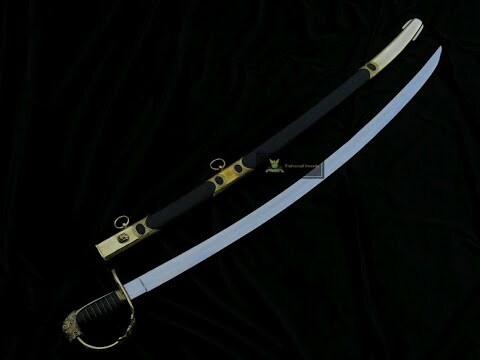 The one offered here is in the style of the army Kyu-Gunto, for it has the more extensive grip backplate - the naval variants had typically slimmer backplates. Please Note : All testing videos are made by experts. Don't try to copy this. The 1803 Pattern British Infantry Officer’s Sword was a response to a needed design change in swords. 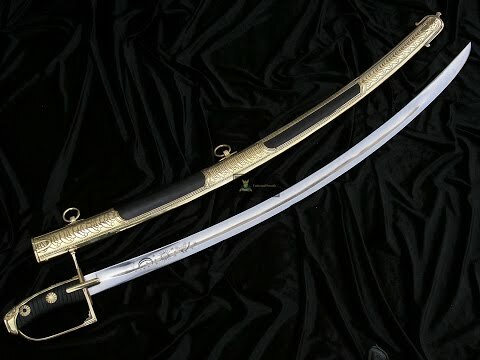 The official 1796 sword was a thin-bladed straight sword, regarded as wholly inadequate for light infantry and riflemen officers who, separated from the dense masses of line infantry and their bayonets, were vulnerable to the fast sabers of light cavalry. Many officers would replace the 1796 with a blade that they purchased, usually a saber with enough heft to parry those wielded by their cavalry foes, and in particular Napoleon's elite skirmishers, among them the Voltiguers. The 1803 Pattern was a final standardization of this trend, finally providing the light infantry officers the sword they needed. This reproduction 1803 Infantry Officer’s sword is made with tempered high carbon steel blade. The hilt is of brass, featuring the symbolic regalia of the British Crown. The grip is of ribbed black leather wrapped with inlaid steel wire. It comes with a leather scabbard with brass accents and two hanging rings. A leather washer at the base of the blade protects the crossguard from colliding into the brass throat of the scabbard. The Grenadier regiments of Emperor Napoleon were equipped with these short sabers. They were not regarded as effective weapons, but the elite troops liked them - probably as a status symbol akin to the sabers worn by the elite cavalry. These sabers found a secondary function as a camp tool for splitting firewood. This reproduction Briquet saber is made from tempered high carbon steel with an all-brass hilt. The scabbard is of black leather with brass fittings. 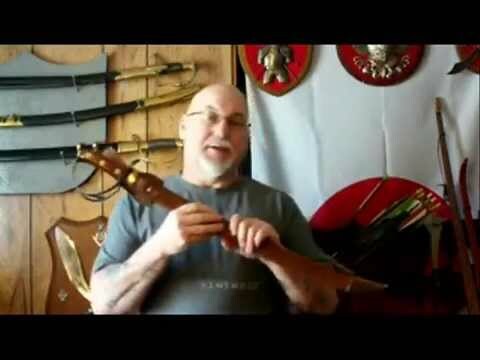 The reproduction of Komissvarja M/1685 sword has done by Universal Swords in the great guidance of Mr. Thomas. It is a very good re-production of a very popular and rare Swedish Military Sword. Superb replica on the most common sword of Charles XII Carolines. 89cm blade of high carbon steel with stamps on both sides. Fitting in blackened iron and rolling pin wrapped with brass. Weight 1.200 kg. 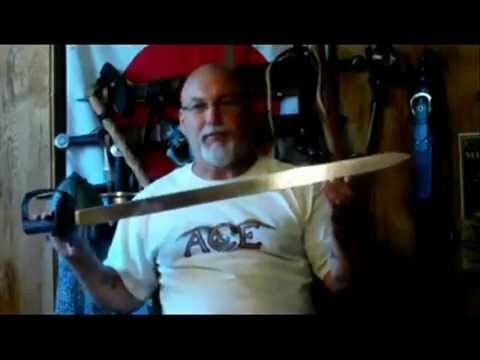 Whole sword measuring 105 cm. Balance point about 11 cm from the guard. Scabbard of wood covered in leather and with mouthpiece and chape of steel included. After 1881, Russian cavalry received a new sword; the 1881 model Russian cavalry saber. They also received a new designation - Dragoon. All Russian cavalry were re-organized into Dragoon units - a tactical nod to the growing difficulties traditional cavalry had with newer, modernizing infantry and artillery arms. This French Hussar saber is similar to other Hussar and cavalry sabers of the period who share a common ancestor in the Polish-Hungarian ''Szabla''. After centuries of mounted warfare, the Szabla became the Hussar saber, ideally evolved for light cavalry combat. Its characteristic curve allowed for deathly sweeping slashes from on high. Its design highly influenced the British 1796 Light Cavalry Saber - a design destined to spread throughout the continent and to the United States. 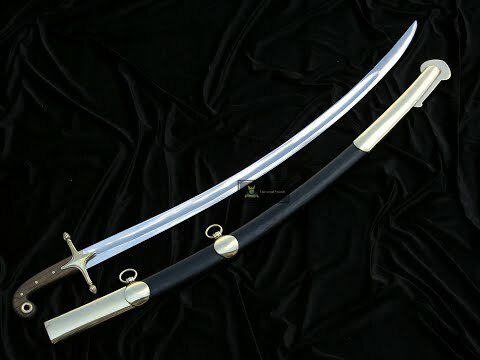 This Hussar Saber reproduction is crafted with a high carbon steel. The blade boldly bears the markings of Klingenthal, the state-run sword manufacturer of France. The blade is also stamped with two period inspection markings on the base of the blade. The hilt is made of brass and the grip is ribbed, thick black leather is inlaid with brass wire. The wood-core scabbard is wrapped with black leather and significantly overlaid with an elongated brass throat and chape with two suspension rings. A leather washer is fitted to the base of the blade to protect the crossguard from the brass scabbard throat. Please Note : All testing videos was made by experts. Don't try to copy this. This 1796 British Light Cavalry Saber had a more pronounced curve, making slashing easier and deadly. The saber, somewhat unusually among its peers, also widened at its tip, putting weight and heft at the tip making its slashes more vicious. 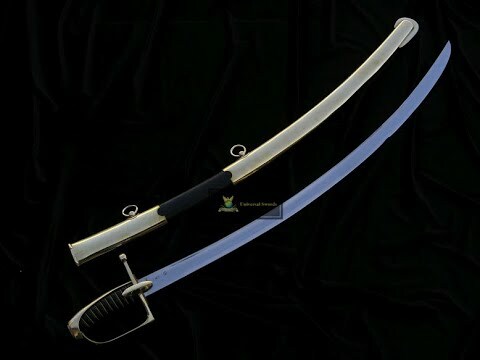 This reproduction British 1796 Cavalry Saber is made with tempered high carbon steel blade. The hilt is of steel and the grip is of tightly molded, ribbed black leather. 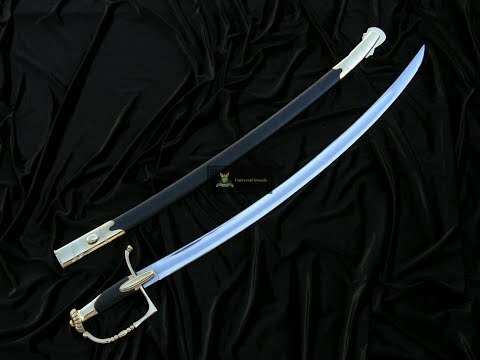 The scabbard is of steel with two suspension rings. A leather washer at the base of the blade protects the cross guard from colliding into the steel throat of the scabbard. This British Cutlass Sword is available in 24", 28", 32" blade sizes. This reproduction Cutlass Sword, features a tempered high carbon blade that has been blackened. The hilt is of steel with a grip of brown painted wood sandwiched over the riveted tang. It comes with a leather and riveted scabbard with brass mounts. This reproduction Japanese NCO Sword features markings seen on existing Shin Gunto. 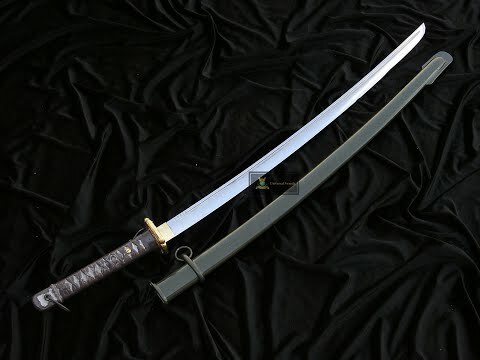 These mass-produced military ''Shin Gunto'' swords substituted the complex hilt construction of traditional blades with an aluminum-cast painted false ''Tsuka-Ito'' lacing. The blades were stamped with factory numbers and the hilt and scabbard feature a simple locking mechanism. 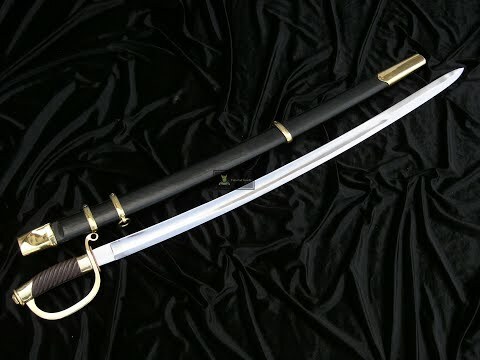 The blade is made from tempered high-carbon steel and the scabbard is steel with a wood-core and drab-painted exterior and the tsuba is of brass. This Royal Navy 1804 pattern cutlass has one innovation that makes it a true tailor-made sea-blade; A cast-iron grip. The rapid fluctuations in temperature and humidity at sea wrought havoc on wooden grips – an iron grip greatly extended the life of the cutlass, saving the state money and keeping the amount of action-ready blades in a ship’s armory to a maximum. This blade is made from tempered high carbon steel and the hilt is of antique cast-iron. It comes with a leather scabbard with a brass belt hook. Napoleon may have been won many battles with the cold calculation of artillery, but a general who won his victories with daring horse-and-sword Hussar cavalry was Andreas Graf Hadik of Austria. At the epitome of his career in 1757 he deftly plucked Berlin from Prussia with a hoof-pounding raid around Prussian armies to take Berlin. Hadik’s Hussar’s smashed the Berlin garrison regiments asunder with a daring charge through their center ranks. Deemed an impossible feat, Hadik’s gutsy move was a moment of great embarressment to Frederick the Great. In a world of weighted shot and calculated cannon this was a harkening to the chivalric panache of earlier warriors. This Austro-Hungarian saber is akin to the sword Hadik would have wielded. This Officers Saber of the Austro-Hungarian Hussars is made with a tempered high-carbon steel blade that has been etched with a sun, moon, saber and slogan. The blade, engraved in the fuller with latin reads: ‘’Andreas comes Hadik Generalis Campi Marschallus Excelsi Consily Aulae Bellici Supremus Praeses’’ – It identifies itself as the sword of Hadik, a General of warfare. The hilt is in brass with a ribbed leather grip embellished with stars of brass. The wood-core scabbard is covered in leather and ornamented in brass with two brass rings. This reproduction Soviet Shaska or Russian Dragoon Saber features reproduced Red Army markings that would have been seen on production blades. The stamping features the Hammer and Sickle of the CCCP with a 1934 production date. Soviet state symbols are featured on the pommel and the sword is adorned with additional Cyrillic marking throughout. The blade is of tempered carbon steel with a deep fuller. The hilt and scabbard accents are of brass and the grip is of painted carved wood. The scabbard is wood-core covered in black leather. This reproduction Hungarian Cavalry Saber bears markings commemorating the merger of Transylvania into larger Hungary following Hungary's 1848 revolution against Hapsburg Austria. The blade bears other nationalistic symbols and slogans. 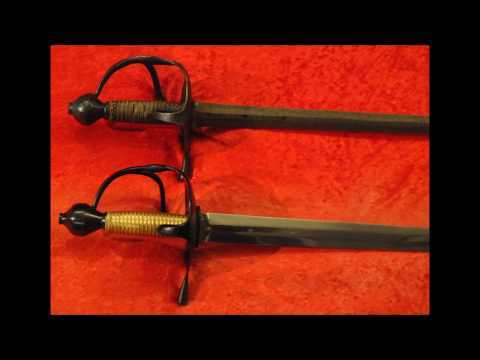 The blade of this reproduced Hungarian Cavalry Saber is high carbon steel that is tempered. The hilt is brass with a ribbed leather grip inlaid with brass wire. 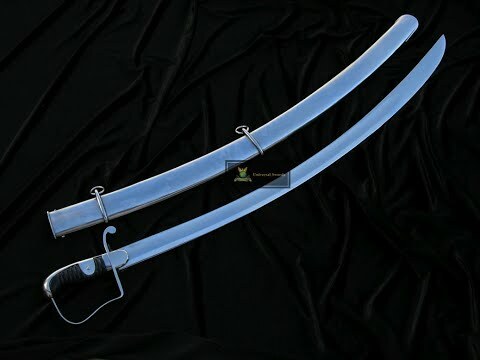 The scabbard is steel with two suspension rings. A leather washer at the base of the blade protects the crossguard from colliding into the metal throat of the scabbard. 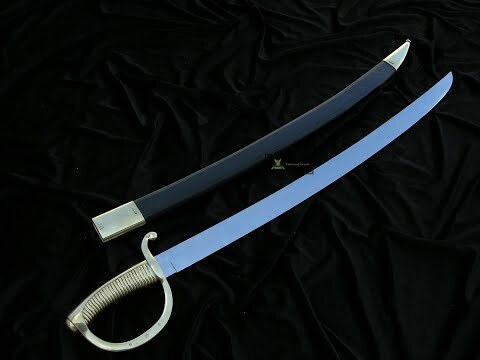 This reproduction Napoleonic Mameluke Saber has a blade of tempered high carbon steel. The spine is etched with the signature of Klingenthal, the guard is made of brass and the grip is of wood sandwiched between the tang and brass mid-section. Brass pins hold the tang in place. The wood-core scabbard is tightly covered in black leather with overlaid brass accents and brass hanging rings.